The president said he has discussed the agenda of the summit with Merkel and Hollande. President Petro Poroshenko, German Chancellor Angela Merkel and French President Francois Hollande in a telephone conversation agreed to form an agenda for the summit in the Normandy Four format. "We agreed that we will initiate and propose an agenda for the Normandy Four summit, where we will definitely demand the observance and implementation of the Minsk Agreements, discuss the roadmap of the Minsk Agreements and the implementation of this process," Poroshenko said in Riga on Monday, 3 April. 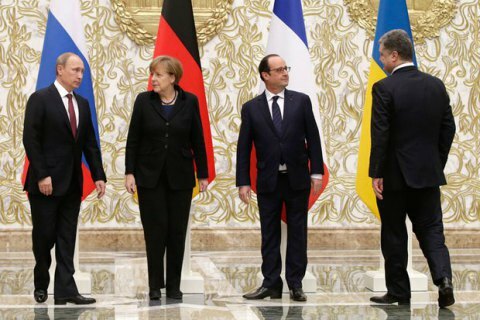 The parties to the so-called Normandy Four talks on the settlement of the situation in Donbas are Ukraine, Russia, Germany and France. The last time the leaders of these countries met, though with little success, was last autumn.